Because I’m always a little behind the eight-ball, a friend of mine* recently introduced me to the Cynefin framework. It’s a way of analyzing and understanding systems. Cynefin draws the world’s systems into four paradigms, arranged in a quadrant as per the attached diagram**. They can fit into Simple, Complicated, Complex or Chaotic. Each paradigm has its own characteristics, and systems can shift from one paradigm to another. When I talk about systems, I’m refering to chains of causality- that is, I do X, and I get result Y. The content of the following post came about from conversations held with members of our response team a couple of weeks ago during a facilitated discussion. Thanks to Andrew for being happy for me to reinterpret and share it here. In a Simple system, the relationship between X and Y is direct, linear, and easy to understand. When I do X, I will always get Y, and it’s easy to understand why that is the case. A hand-pump is a good example of a Simple system. I move the handle up and down, and I create hydraulic pressure within the pump, and water comes out of the nozzle. If the system is working properly, I will get this result every time, and if I don’t get this result, then the problem is some easily identifiable breakdown within the mechanics of the system. In a Complicated system, the relationship between X and Y can be worked out, but there may be many stages in the process. When I do X, I get Y, but a lot of other things need to happen along the way for that to remain true. An Airbus A380 is a good example of a Complicated system. When the pilot pushes forward on the throttle, all sorts of electronic commands are sent via carefully constructed circuitry to various mechanical components which allow fuel to flow to other mechanical compenents which eventually cause turbines to spin which force air through intakes which push the aircraft forwards until thrust creates enough forward momentum that air flowing over and beneath carefully arranged flight planes can lift the aircraft into the air. The planning and analysis that has allowed this reality to occur has taken decades to develop. If I do X, I will get Y, providing other parts of the system are in alignment and the analysis has been successful. In a Complex system, X and Y have a relationship, but it is one characterised by feedback loops and a measure of uncertainty. It is not necessarily clear how I get Y from X, and by reaching Y, I may in fact affect X. An example of a Complex system might be a Hummingbird. It is an intricate, delicate set of chemical and biological reactions which allow it to remain alive and in flight. It requires all manner of inputs to maintain stasis- heat, energy in the form of nectar, oxygen to feed into its bloodstream, and even (on a simple level) certain needs that are best described as ‘emotional’ (or perhaps ‘evolutionary’) such as a mate. The way these various inputs react will determine how well the hummingbird functions, and the links, while perceivable, are highly interdependant and affect one another in a delicate ballet of constantly shifting targets. If I do X, I will get Y, which will inadvertantly impact upon X, which then affects Y, and so forth. In a Chaotic system, the relationship between X and Y, if there is one, will be very difficult or impossible to determine. If I do X, there’s no guarantee what I’ll get, and I certainly can’t be certain that I’ll acheive Y, and even if I do achieve Y, it may have nothing at all to do with having done X. A good example of a Chaotic system is a burning house. There are so many processes happening so fast and in no discernable order, and the situation is evolving so rapidly and unpredictably, that it’s nearly impossible to actually map what is happening, either during the process, or even with the benefit of hindsight. The molecular and physical interactions taking place between heat, fuel and oxygen can, on a broad level, be understood, but how the intake of air through a particular cracked window, or the failure of a particular wooden support-beam, or the intensity of heat caused in one specifc portion of the ceiling, all work together to cause the house to collapse, will probably never be understood in detail. I can do X, but whether I get Y or something else entirely will be determined by a range of factors that are most likely entirely out of my control, and may never be fully analysed. 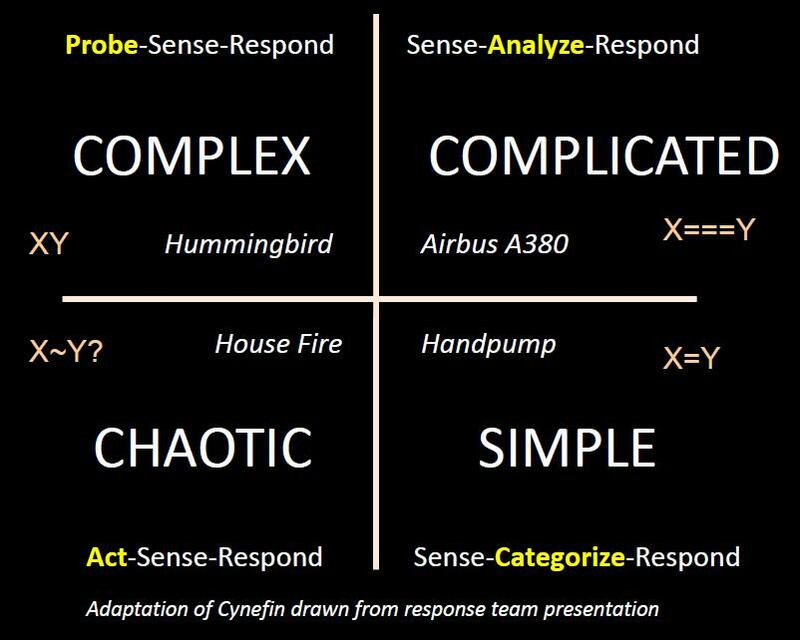 You now know pretty much all I know about Cynefin. Well, except that Cynefin is a Welsh word (given to the framework by its Welsh creator Dave Snowden) which in its approximate translation means (and here I quote Wikipedia because it is far more eloquent than I’ll be able to explain) : “the sense that we all have multiple pasts of which we can only be partly aware: cultural, religious, geographic, tribal… illustrat[ing] the evolutionary nature of complex systems, including their inherent uncertainty”. A pretty sophisticated philosophy to be summed up in a single word, if you ask me. As one whose Grandparents hail originally from Cardiff, it makes me quite proud of the language. And as a Geographer it gets me kind of excited too. So what has this got to do with anything outside of academic text books? Well, actually it helps us understand how organizations respond (or fail to respond) to the challenges they face with the systems they have developed. Let’s look at aid work. When aid gets talked about in the public sphere, it’s generally messaged very simply in the media. Children are starving. They need food. An X-Y relationship. Ditto following an earthquake: houses are destroyed and people are in the rain: Give them tents. A Simple paradigm. Likewise there is a tendancy for agencies (and most other organizations) to create simple management systems, like financial acquittals and purchasing procedures. You spend amount X, and you acquit accordingly; you want to purchase Y, and you follow the linear procedure step-by-step. Simple. When aid agencies manage their response programs, they create complicated management systems that involve careful analysis of all the factors, putting them into project documents with LogFrame Analysis that looks at cause and effect and all the possible links along the way that need to be managed. An X—Y relationship. A Complicated paradigm- certainly not Simple. However the realities of aid responses are neither Simple nor Complicated. At best, if you take a stable long-term chronic emergency like the situation in Darfur, it is fraught with feedback loops and vague inter-relations where cause and effect are highly flexible and interdependant. In Darfur there are more than two dozen armed groups operating, with their areas of control shifting on a weekly basis. When one gains strength, others weaken. They have their foundations in specific community and ethnic groups with long historical relationships. The drivers for the conflict are primarily natural resources, but there are also ethnic, political and other economic implications as well. By providing aid to one group you inadvertantly exclude or depower another, and emotions such as resentment or loyalty then shift that landscape. I could go on for pages describing the Complexity of Darfur. We can understand bits and pieces about it, and trace some of the loops and mechanisms in the systems, but we’ll probably never manage to map it in its entirety, and there will always be things outside our control- from human behaviour to the climate. Worse are the very large rapid-onset emergencies, especially ones where there is pre-existing political tension. Take the earthquake in Port-au-Prince. In the days following the earthquake, nobody knew what was going on. There was no knowledge of how many people had died, what resources were available, what access routes existed, what authorities still had control. There was no clear understanding of what the needs were, of how big those needs were, or how best to respond. Uncertainty was rife. With the underlying criminal and political dysfunction, there was no knowing whether bringing food into the city would save lives or create riots; whether distributions of aid goods would fund black markets or help people get back on their feet. There was a vacuum of reliable knowledge in the midst of an enormous and rapidly evolving crisis, and all the while more and more organizations were pouring into the city, all of which having to be managed, all with their own relationships and resources, and all impacting the context itself in an interrelated and entirely unpredictable way. There is also a hypothesis that the paradigms are representative of a transition process. Emergencies start off as Chaotic, then as things settle down they become Complex, and then as time passes and new systems become established they become Complicated (and by inference able to be analyzed), and finally they might even settle into a Simple paradigm where cause and effect can be well understood and managed. In reality, this is not the case. Even long-term development contexts with slow changes, high stability and no underlying conflict issues (of which there are relatively few) will sit very firmly in the Complex paradigm (and not, as I suggested earlier, in the Complicated realm; the presence of human relationships and interactions, even in the simplest of development contexts, ensures that even stable development programs usually live in the Complex realm. Thanks Conny for pointing this out). Emergencies, especially large ones with political, social or conflict issues embedded, will often cycle from Chaotic, to Complex, and back to Chaotic again (Darfur, Democratic Republic of Congo, Chad…). So take a step back. Humanitarian organizations have to operate either in Chaotic or Complex paradigms. However they attempt to manage them using tools that assume a Complicated paradigm. And they talk about them to their donors and the media as though they are a Simple paradigm. However far worse from an organizational perspective is attempting to manage a Complex or Chaotic paradigm using tools that assume a Simple or Complicated one. Take a look at procurement procedures. They are Simple. They are driven by things like purchasing committees, bid analysis and spending authorities. You can only purchase good X when a committee has agreed that X is an appropriate purchase to make, when 3 different bids have been submitted to the committee and one of the three has been identified as most cost-effective, and when a manager with the appropriate level of authority has signed the appropriate forms. What do you do in a Chaotic environment when in order to save lives you need to purchase X, but two of the five committee members are digging through the rubble of their homes looking for family members, only one provider of X still has a functioning storefront, and the manager with the appropriate level of authority has had to travel out of the city for two days to follow up another developing crisis? Simple systems fail. Or what about the Complicated systems, relying on careful analysis? Procedures suggest you carry out a careful needs assessment, taking into account gender concerns, environmental impact, human rights, long-term sustainability, a careful transition plan, a Do-No-Harm analysis of how your intervention will affect relationships between different stakeholders, and a detailed critical assessment of the cultural appropriateness of the specific intervention. Is this the best possible intervention in terms of impact, and have other alternatives been assessed and discounted? Have you carefully mapped out the cause-and-effect relationships through the chain, looking at what inputs are required to carry out activities; what outputs can be delivered from those activities; and what outcomes will come about as a result of delivering those outputs, all contributing to a higher goal, assuming that certain caveats are met and certain risks have been appropriately managed. In Chaos, this pressure to conform to a Complicated process is hardly appropriate. Not only does it take too long in a rapidly evolving emergency (putting lives at risk) but it is also entirely questionable in terms of its value. 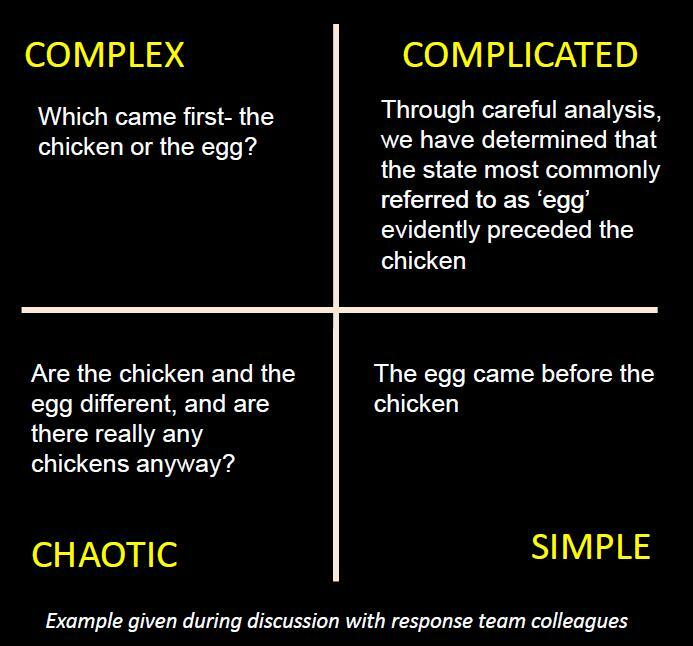 In Chaos- and indeed even in Complexity- there is no way to guarantee that analysis is accurate. There are so many uncertainties in the system that any number of outcomes could result from you actions, and any number of other factors could input into your carefully devised response system to throw the result right off balance. 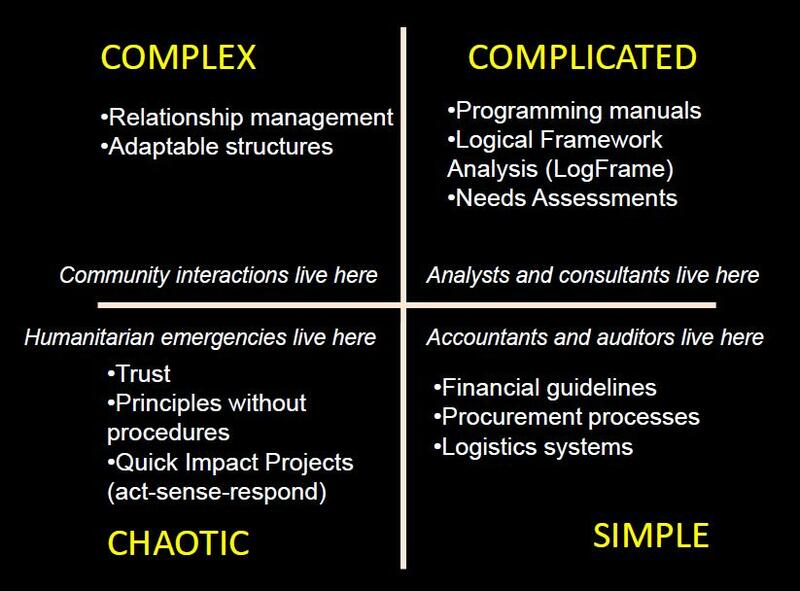 Yet for some reason, we continue to try and manage Complexity or Chaos using Complicated systems and Simple assumptions. A lot of this is, of course, human nature. And more specifically, organizational nature. Organizations naturally try to protect themselves. Few organizations are as risk-averse as NGOs, who have a fragile grasp on their own financial and organizational existance due to a reliance, effectively, on other peoples’ goodwill. And the best way to do this? Create systems that manage their environment and (ostensibly) reduce risk to the organization and its members (particularly, those members who hold the responsibility near the top and would otherwise be held to account, if those systems didn’t protect them). I’m not singling anybody out for criticism here. This is how people function when you have heavy organizational hierarchies and structures. The biggest NGOs out there have in excess of 40,000 employees globally- absolutely massive- and having convoluted management systems that go along with that is very nearly inevitable. Realistically we do need to find another way if we hope to remain relevant and effective however. It’s easy to see how too many Complicated systems could choke an emergency response making it slow and useless. What we need are approaches to managing a response (that is, the decision-making processes, authorities and accountabilities which staff running the response are bound by) that are flexible, lightweight and rapid. First and foremost, in my opinion, we need trust. Organizations need to have trust in their personnel, and have confidence that given the responsibility, they will make good decisions in the heat of the moment. Organizations need to be prepared to stand by those decisions, for better or for worse, accepting the process that occured. In order to trust, of course, organizations need to invest in people. They need to develop not just their skills, but their experience, and not just their experience, but they need to allow them the opportunity to develop experience with authority and decision-making. Yes, this involves a real risk on behalf of the organization, and this is where quality decision-makers and judges of character are required up the organizational hierarchy. Processes (and people) need to be motivated not by procedure but by principle. Emergency responses need accountability to communities, for example. The Humanitarian Accountability Project (HAP) has all kinds of standards and checklists for demonstrating downward accountability- but in the early days of a response they are far too unwieldy to be applied completely and universally. Instead, the principle of accountability needs to be applied by decision-makers and implementers. An organization must invest in its staff so that they are motivated by and personally immersed in those principles, so that they can then reinvent and apply them as they go, almost instinctively. An organization shouldn’t have to prescribe what accountability must look like, but instead leave it to the capacity of the individual responding to find how best to apply that accountability principle in the midst of the chaos. Systems themselves need to become quick, adaptable and light. Rather than spending hours or days negotiating what a response team should look like, you need a standard, scalable response model. What are the basic functions in a response team? Take a simple Incident Command System setup for example (Leader, Communications, Security, Operations, Planning, Support Services). Six people, optimal to manage, and depending on the scale of the emergency you might just need six people, or each person might become the director for each of those branches which may then be populated by teams or even sub-teams within teams- but the starting point is already there, and within minutes of making a decision to respond, you already know where to begin with your staffing, your lines of responsibility, and your terms of reference. Many other response systems and procedures need a similar stripped-down and scalable approach applied to them. Feedback mechanisms need to be made light and flexible. Reporting to donors needs to be fast, reactive, easy. Social media anybody? Imagine if, instead of providing long detailed report templates populated with data which took hours or days to compile (using up valuable staff time that could have been spent elsewhere) the public were satisfied with the medium of Story- live Tweets from the field while the response was going on, and periodic blog updates providing thoughtful analysis. Imagine if, instead of doing household surveys that take five or six days to plan and construct, and a week for a team of assessment staff to actually complete (not to mention the time respondants have to invest in answering questions), and another week to analyse and write up, it was actually the norm to carry out drive-by assessments and informal key-informant interviews. Imagine if, instead of designing detailed project logic templates, analysing cause-and-effect, and trying to decide which interventions to run, we looked at the broad context in a snapshot and then picked from a menu of pre-written response programs based on what we’ve seen and done in prior emergencies, tweaked them to fit the context over an hour or so, and just started running them- tweaking as we went once we saw what sort of effect they were having. 2. The decision-makers within the response team are intelligent, experienced people who have developed the ability to read and respond to an emergency situation. In fact I do want to stress- as I have mentioned repeatedly on this site and linked elsewhere to others better at saying it than I am- that program quality is essential, that we as aid agencies and humanitarians owe it to the recipients of assistance to give them the very best we possibly can in line with their God-given human rights. But in a rapidly evolving chaotic situation where lives are at stake, the best way we assist in protecting those rights may not be through applying Complicated management approaches or Simple compliance mechanisms, but rather in the reactions and responses of trusted individuals, working with experienced teams, making immediate judgements based on rapidly observed realities, supported by rapidly deployable resources within flexible management systems, which can then be swiftly adapted once impact and feedback mechanisms have been observed. We don’t, currently, have this. We need to meet a Chaotic paradigm with tools that embrace the Chaos, and not try and make it any more Complicated. Dave Snowden, designer of the Cynefin Framework, points out quite correctly that two elements of the framework are not discussed above. The first is the notion of a fifth space called ‘disorder’ which sits at the nexus of the four other spaces. In this space- where uncertainty around casuality dominates (we have no idea at all what the causal links are), systems break down and people revert to their own comfort-zones in order to make decisions. You might look to something like the Wall Street Crash of 1929 to illustrate this example- where the economic systems of the day were crumbling, people were panicking, nobody knew what to expect or what was going to happen, uncertainty was supreme, causality went largely unanalysed, and everybody was making decisions for themselves- whether dumping stock, pulling money out of banks, or jumping out of windows. The second element not discussed is the catastrophic failure boundary between ‘Simple’ and ‘Chaotic’ paradigms. It is the implication that if there is an over-reliance on Simple systems when they are not appropriate (‘complacence’), systems fail and an organization will drop suddenly (and with violent results for that organization) into the Chaotic realm. This can be found where organizations fail to adapt- take a look at the failure of the US housing market a couple of years ago for a good example. Or the risk, for NGOs, that if they don’t adapt their management systems away from the Simple/Complicated paradigms to be appropriate to the Complex/Chaotic paradigms in which they live, they too could drop off this catastrophic boundary and find themselves swimming in managerial Chaos. *Thanks Andrew for some lively conversations in Antigua, and to @vivmcw who introduced us to Cynefin in the first place. All photos, from Candy to Ice Crystals, are my own as per usual. Loving this post! Photos look superb with the black background too. Dave’s Cynefin framework has changed my worldview/operating system … which has an impact across everything I do. Nice article and acknowledgement of the nature of many Humanitarian issues. There is a lot desire, to ascribe simplicity to poverty and the actions of the poor, when in fact the situation is often any thing, but simple and the participants in a crisis or even preceding a crisis are acting very rationally. If it wasn’t explcitly stated before – CHAOS and DISORDER are different. James Gleick’s book (Chaos: The making of a new science) is all about the hidden order in nature, or in this case, in community development. It is really hard to analyze but can be done in theory. You often need much more information than is practical in social settings. It works well in laboratories where a million replicate measurements is not a stretch. DISORDER is a lack of cause-effect relationships. All you can do is try to create order and get into one of the other realms, like complex. Thanks Marc- for taking the time to read (carefully) and comment. You’re absolutely right- Chaos and Disorder are distinct fields, and there is an order or pattern to chaos, however hard it might be to understand or perceive- hence the amount of interest/study in chaos theory and associated fields of thought. 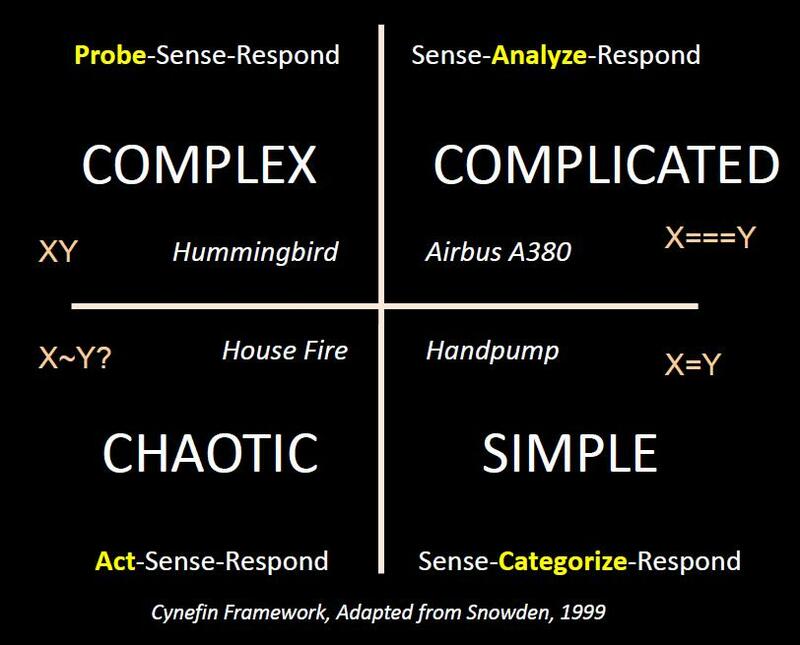 The components of Snowden’s original model which I did not explore in this blog are the catastrophic boundary between the Simple and Chaotic dimensions (crossing from Simplicity into Chaos is highly disruptive), and a central ‘Disorder’ field which sits at the nexus of the four main components and is distinct, as you’ve said, from chaos. I like your straightforward explanation of disorder- great. Thanks too for the book title. I’m really interested in understanding more about chaos theory and science- would you recommend Gleick as a good starting point? great post. would you like to join a risk management group on linkedin.com called the Black Swan. We have referenced your paper. Learnt a lot then from 10 minutes of reading. I love the exploration of the ideas of “trust” and “principal” coming into play. I think you’re right in that people only build in character and responsibility once they feel that others are willing to take a chance on them and invest in them. That is no doubt going to be the biggest challenge for risk averse NGOs whose supporters can be skeptical and anxious. And therefore it really is necessary to connect supporters into the complexities of development so that they are behind NGOs looking to entrust and empower field workers in difficult situations. I’d love to see the communications of NGOs during humanitarian crises rallying support for relief workers excelling in chaotic situations rather than trying to explain away the fears of misspending or ineffectiveness. Pingback: Nothing new under the sun « Wait… What? I came across Dave Snowden and Cynefin a couple of years back and have been following the debates ever since. I also used the model (with Dave’s agreement!) to warn against thinking about work as just Simple or Complicated, as part of my own analysis of complexity and organisational capability in my book, The Change Equation. I’d just like to add one suggestion to your excellent analysis. When you are in the Complex or Chaotic fields, it isn’t enough to adopt fast and informal story-based feedback mechanisms. That tells you what is happening in discrete micro views – it doesn’t enable the NGO to refine its response. In order to do that, it needs insight – a clearer understanding of the problem. Dave’s response to this situation was to develop the Sensemaking methodology: collect as much of such narrative data as you can, apply a taxonomy and use computer modelling to analyse and make sense of what is happening. I’d suggest that this would be an appropriate way forward for the aid community – I know some projects have been undertaken but it’s not yet an accepted toolset – it should be. Interesting article for the Response Team,Systems themselves need to become quick, adaptable and light. Rather than spending hours or days negotiating. Take a simple Incident Command System setup for example . Six people, optimal to manage, and depending on the scale of the emergency you might just need six people.Appropriate for any scale of response. I just discovered your excellent review of cynefin. 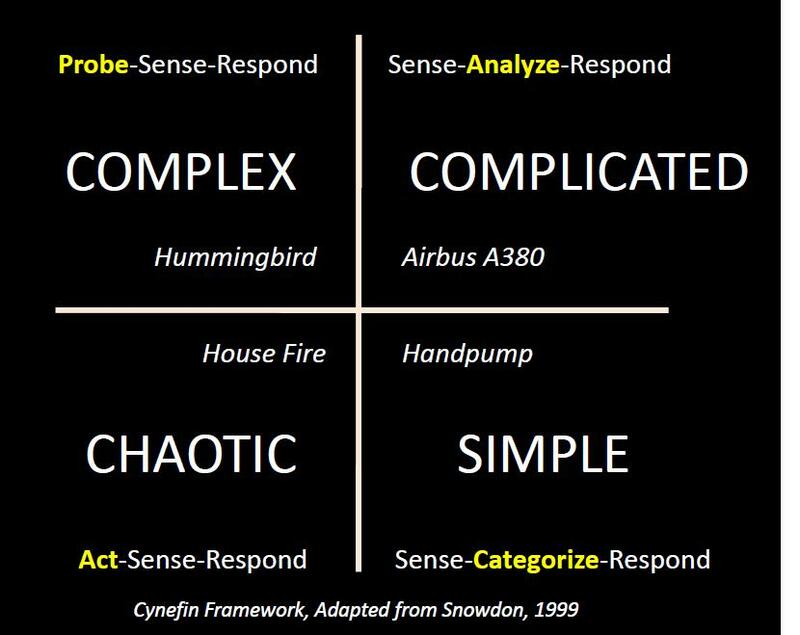 One suggested “friendly amendment” about chaos that underscores Snowden’s claim that cynefin is a sensemaking framework, not a categorization framework. If my house is burning down, I agree with you: this is an example of chaos. But to an experienced firefighter, a burning house is likely to be something in the simple domain. He or she has been to dozens if not hundreds of similar incidents, and much (but not all) of the event is knowable and predictable. This example might also illustrates the potential “catastrophic failure boundary between ‘Simple’ and ‘Chaotic’ paradigms.” But that’s a comment for another time. Thank you for writing your article.